My family is, to put it mildly, big into food. As well as caterers, chefs and recipe developers in the family, there are plenty of us whose day job has nothing to do with food, but we still love to cook, eat, talk about food and entertain. At pretty much every family gathering, there will be pavlova, thanks usually to Auntie Emir. A few years ago she gave me her recipe. 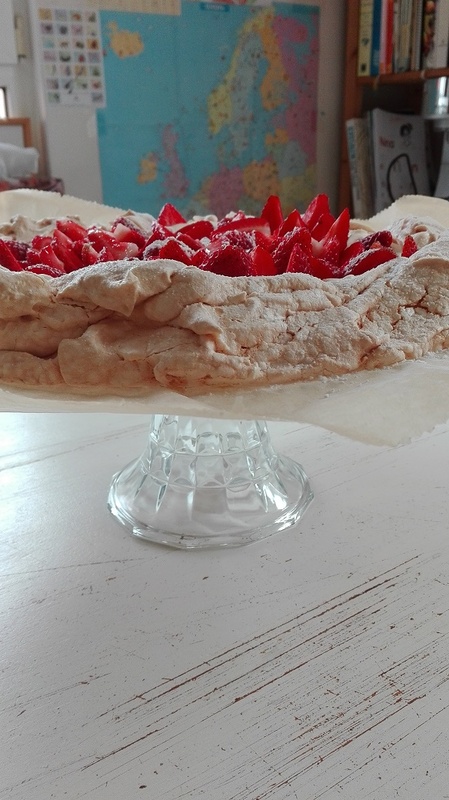 Germans are not familiar with pavlova at all and I wanted to introduce them to it. I mean, honestly, how can you consider yourself to have a happy, fulfilled life if you have never eaten pavlova with strawberries and cream? My first few pavlova attempts ended perfectly. I would look up the text message from my auntie with the quantities, beat it all together, bake it, cool it and look forward to my guests arriving. The problems started when I took down the recipe into my notebook after getting a new phone. Somehow I managed to write down the wrong quantity of vinegar, resulting in my pavlova not getting crisp at all since the vinegar and the cornflour are responsible for making a pavlova a pavlova and not a meringue. 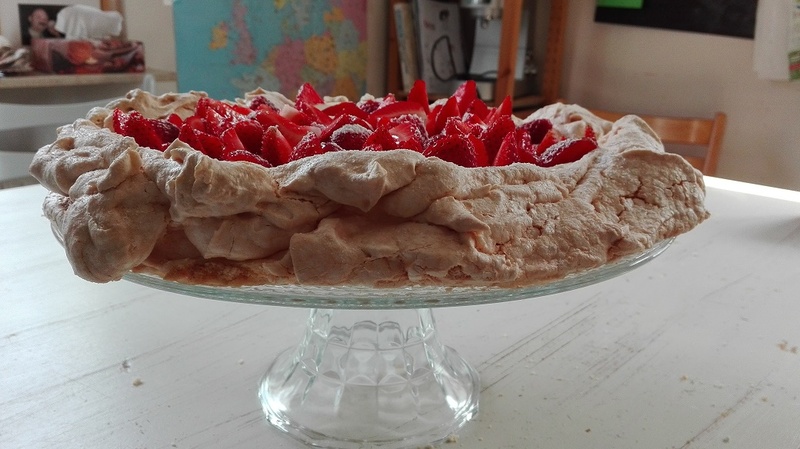 On that note, people often confuse pavlova with a large meringue. They are two different dishes. Meringue is made of sugar and egg and is crisp all the way through. Pavlova, on the other hand, is crisp on the outside and light and fluffy in the centre. The cornflour and the vinegar make all the difference, even though only a very small quantity of each is needed. After a small bit of research I found my error and corrected it in my notes. I’m back on form, pavlova-wise. Making pavlova is really very simple once you follow a few easy pointers. Lay a sheet of baking parchment on a baking tray. Preheat the oven to 120°C. Using an electic mixer beat the egg whites till stiff then add in the sugar one tablespoon at a time. Beat until the sugar is dissolved and then add the next spoonful. You will know the sugar has dissolved when you see there are no more crystals in the egg white. Once all the sugar has been added, check it has dissolved by rubbing a small amount of the mixture between your fingertips. If you can feel sugar crystals, keep beating. Add the vinegar and give the mixture a few more seconds’ beating in the mixer. Then sieve the cornflour over the egg white and swiftly fold it in using a metal spoon. Spread the mixture in a circle of approx. 24cm diameter on the baking parchement. You might like to make a circle on the paper with pencil beforehand. Place the pavlova into the oven and bake for an hour. Cool in the oven for a further hour with the door ajar then remove from the oven an leave to cool completely. 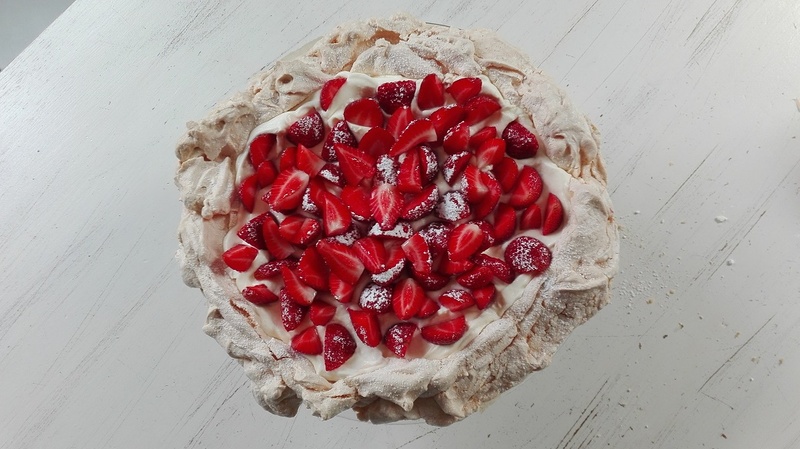 The pavlova should be white or slightly beige in colour, crisp to the touch and soft on the inside. 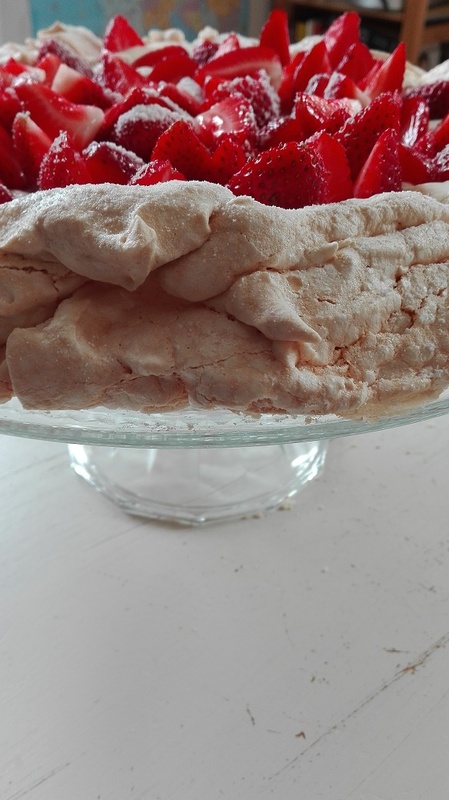 If you have accidentally added too much vinegar, bake the same pavlova again at 150C for half an hour. This will crips it up but also give it a slightly darker colour. Just before serving, whip the cream and spoon it onto the top of the pavlova, leaving an edge of pavlova. Add the strawberries, whole, quartered or sliced depending on your preference, on top of the cream. If the strawberries are not as sweet as they could be, sieve a spoonful of icing sugar over the top. Serves 6-10 people, depending on how much of a sweet tooth they have. Wow! That looks completely amazing… I would love to be able to make one of these. Give it a go Annette. It is not as tricky as you might thing. Plus the cream and berries can cover up any tears or cracks. Oh do give it a go. I bet you’ll be surprised how well it turns out. Never had pavlova? That needs to be remedied! Give it a go Jess. It is deliciously sweet and light – like a cloud with berries on top. 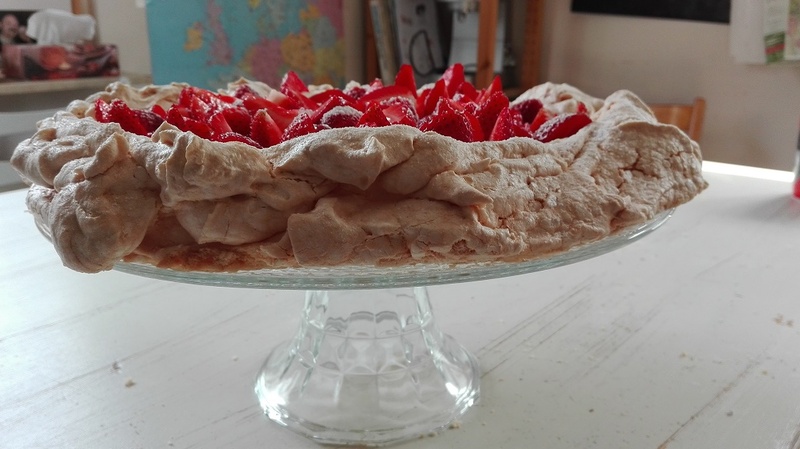 This is fascinating – I’ve never made a Pavlova in my life (or a meringue for that matter) but I am quite partial to eating them 🙂 I would love to be a guest in your home – all the amazing stuff you’re always whipping up! Thanks so much for joining me again on #thetruthabout Fionnuala! Oh give it a go Sam. It can’t got that wrong, and even if it does, it will still taste great. Yes, I’m with you on both. Thanks for your comment Victoria. 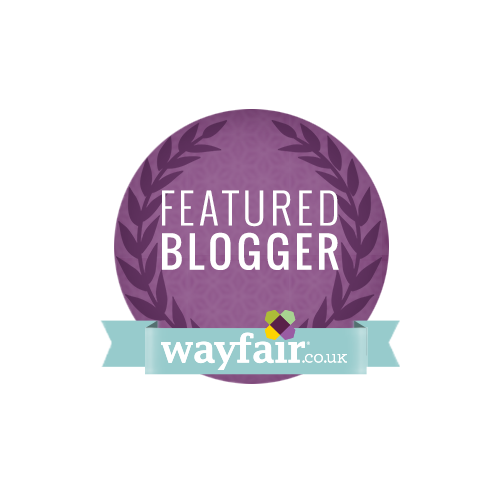 I was just trying to figure out why my pavlova is not drying on the outside and I found your post! Now let there be light! ( Pun not intended as this is also Easter almost Sunday, the Eastern one). I understood that I actually backed meringue. Many thanks for tips and tricks! Then I moved to other articles like your moving to Germany, speaking the language, being part of the community… I saw Rheinland Pfalz! I am happy to be sharing the same area! Although I am counting only my 3rd Easter in Trier and still feel half here, half back home. I wish you and your family a beautiful spring and I’ll keep reading you! Thank goodness for google! You just saved my pavlova that wasn’t crisping up in the oven after an hour. I think I put a half tablespoon of vinegar instead of a teaspoon, and after I put it in the oven, I found my tablespoon of cornflour still on the counter . Adding about 20 minutes on 150C seems to have saved it. Hopefully I can take it out of the baking pan tomorrow without breaking it apart! Great! I hope it all worked out in the end.